Louise Ebrel is an acclaimed singer of Breton's emblematic traditional call and response vocal style, kan ha diskan, as well as the daughter of Eugénie Goadec of Brittany's renowned Sœurs Goadec. She dropped by WFMU's Transpacific Sound Paradise last month for a brief performance with singing partner Ifig Flatres, a leading voice among Brittany's new generation of traditional vocalists and part of the new-roots ensemble Oktopus Kafé. In these duets the kaner (lead vocal) begins the verse. After a brief overlap, the diskaner (secondary vocal) takes it up and the process is repeated. Throughout the tune, the vocalists employ nonsense syllables to fill the space between lines. 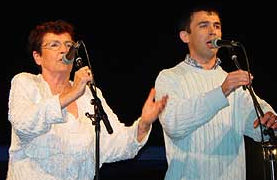 Louise and Ifig sing in Breton, an insular Celtic language brought over to present-day Brittany from the British Isles during the Early Middle Ages. The language is now considered endangered and is mostly spoken in Western Brittany. The artists were here for a Breton style Fest-Noz - "Night Festival" - held at Connolly's, 121 W 45 St. on Saturday May 22, 2010. The festival was presented by New York's Breton cultural society BZH-New York. Their performance at WFMU was part of an episode of Transpacific Sound Paradise (hosted by Rob Weisberg) featuring music from Brittany. You can view the playlist and listen to show in its entirety here.